Raccoon damage can happen on the outside of the home as well as inside. Raccoon control includes raccoon trapping, raccoon removal and raccoon exclusion such as sealing up the raccoon’s entry points and placing raccoon proof caps on chimneys. The most common complaints associated with raccoons damage include; raiding garbage cans, noises in attic at night, and preying on birds in nests and feeders. 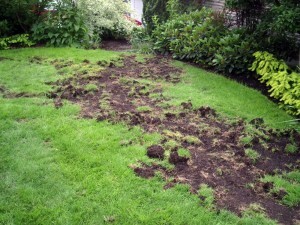 Raccoons will dig up the ground looking for worms, and grubs, causing damage to lawns. Raccoons will often enter homes in the winter and spring, most commonly inside attics, to escape the cold or to nest and raise their young. Raccoons are strong animals and can damage the shingles, fascia board, soffits and vents of structures they enter. Common raccoon damage within attics includes damage to the insulation from feces/urine, damage to the duct work or wiring, staining of drywall from urine, and water damage at the entry point.